Early in the year 2000 my lomilomi teacher Aupuni Iwi'ula told my class that he would give each and every one of us students in his class a makana, the hawaiian word for a special gift. In fact, he confidently promised to grant each of us ANY makana that we requested. It could be anything!! I became a fortunate recipient of Aupuni's wisdom, insight, trust and generosity. Here is my story. Aupuni invited us to thoughtfully consider our options, and then to carefully craft a written description of the object of our heart's desire which we would, in due time, receive from him. He cautioned us to be careful and clear in the way we worded our descriptions. For example, he told us that one of his previous students, a massage therapist, had asked for a "larger client base". Not long thereafter a football team sought out her services and she ended up with lots of clients with very large bodies. This is probably not what she had in mind when she asked for a "larger client base". We were given a month in which to craft descriptions of our desired outcome. I enjoyed this project!! It was like winning a large lottery, but even more powerful because I could ask for anything money could buy, or I could ask for something that couldn't be bought with all the money in the world. It was like having my own personal magic genie. My imagination was free to consider things large and small, things that had previously seemed impossible for me to attain, or things that I had never even considered. I didn't have to figure out how to manifest this promised gift, I just had to decide what I desired, and to describe it clearly in words. Wow! And, I totally believed Aupuni when he promised to give us each whatever makana we chose. His presentation was so compelling that I absolutely believed in his ability to produce all these gifts. He trusted us, and I trusted him, and we all clearly trusted in something bigger than all of us. I finally settled on asking for something more precious than money could buy. At that time I had recently begun attending, and enjoying, hula class. However, I felt awkward dancing and I wished I could dance better. I told myself if I could just feel the rhythm that I'd be able to dance better, more easily, more fluidly and more beautifully. When I returned to lomilomi class with Aupuni the following month I told him that my chosen gift was "to dance hula with correct rhythm". He suggested that we modify my wording to read "to dance hula with the spirit of aloha". I was delighted with this clarification. I continued attending monthly lomilomi classes with Aupuni, and I also continued attending weekly hula classes with Kumu hula Gloria Nahalea. I never mentioned the makana project to Kumu Gloria because I didn't want to jinx the project. I wanted the gifting to happen naturally and organically. A couple months later in hula class Kumu hula Gloria made an unusual observation and specific declaration, not just to me privately, but in front of the entire class. I've never heard her say anything similar before or since. 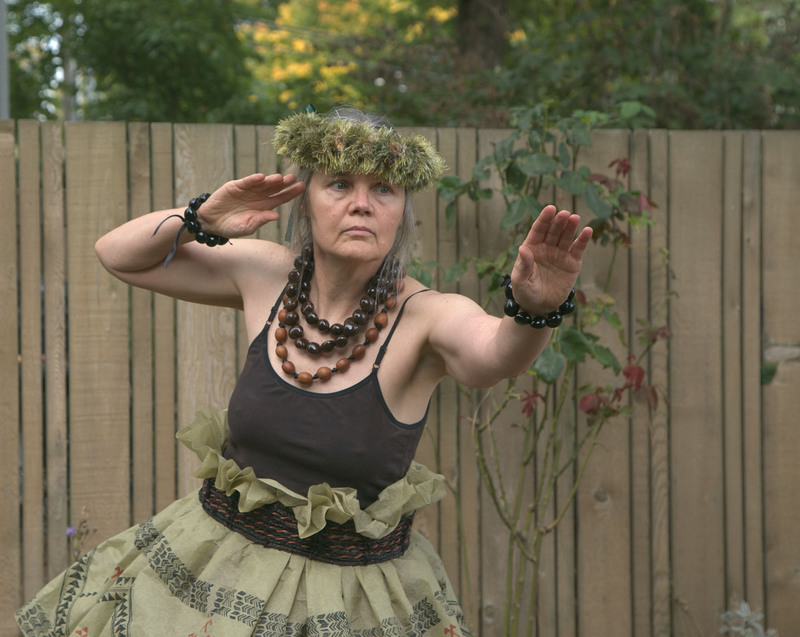 She commented, "We can all see the essence of hula when Barbara dances. Now we are simply working with her on technique." When I heard these words I thought to myself, "Wow, this is a very clear and specific reflection that I have indeed received Aunpuni's promised gift, I am dancing hula with the spirit of aloha, and it shows." And, I fully believed this. That was almost 17 years ago now. I am still dancing hula with the spirit of aloha, And I am also still working on improving my hula technique, and always will be. I am still working on improving my timing because sometimes my injuries throw me off. My hula teacher still sometimes coaches me, "Watch your timing, Barbara". The bigger picture here, however, is that 17 years later I am still dancing hula, still attending hula classes, and still loving hula. Hula has been a mainstay in my life all these years. 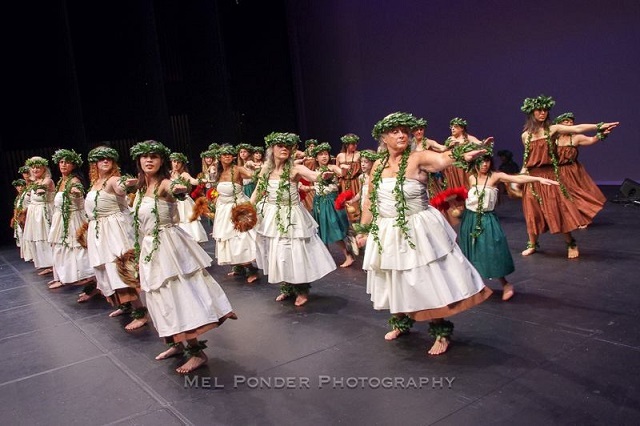 Dancing hula helps me feel beautiful, helps me feel strong, helps me feel healthy, and keeps me connected to the Hawaiian community, and to the Hawaiian language. 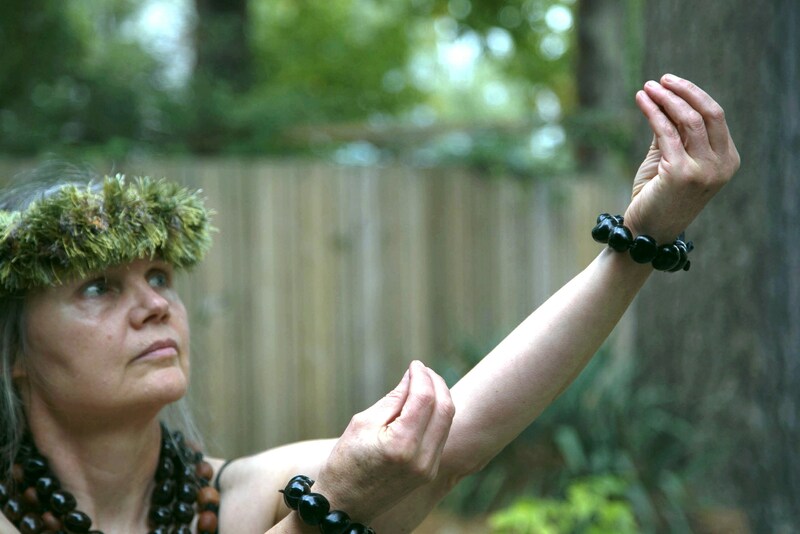 Dancing hula keeps me living the spirit of aloha. Words are powerful! Word of encouragement we give each other can lift us all up in the moment they are voiced, and for many years to come. Recognizing and specifically acknowledging gifts is a powerful process. The gifts I received from Aupuni via this project include not only the gift of dancing hula with aloha, but also the experience of thinking outside the box, the experience of specifically visualizing my desires in order to manifest them, the experience of asking for and accepting help, and finally the experience of believing that I do indeed dance hula with the spirit of aloha, for it is my belief that has made dancing hula with the spirit of aloha my reality. Aupuni "walked the rainbow" in 2011. Mahalo Aupuni for sharing gifts with me, and with so many others.